Stormy looking scenes need not be ominous and scary – color just part of the rainstorm and let some light shine through, and it’ll give the impression it’s a ray of sunshine on a rainy day! Watch the video below or click HERE to see it in HD on YouTube. 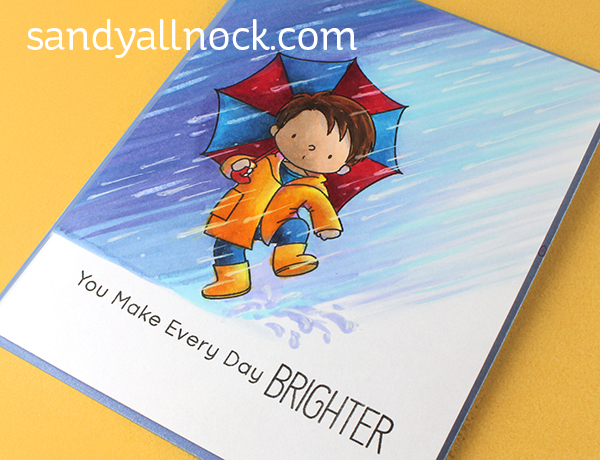 And this is the original card that inspired this video – made with the Puddle Jumper stamp set! This evening (Monday the 16th) I’ll be hosting a Facebook Live in my Bible Journaling Facebook Group, talking about stacked lettering – join me at 4pm Pacific/7pm Eastern! Sandy, your work it’s just fabulous !!! 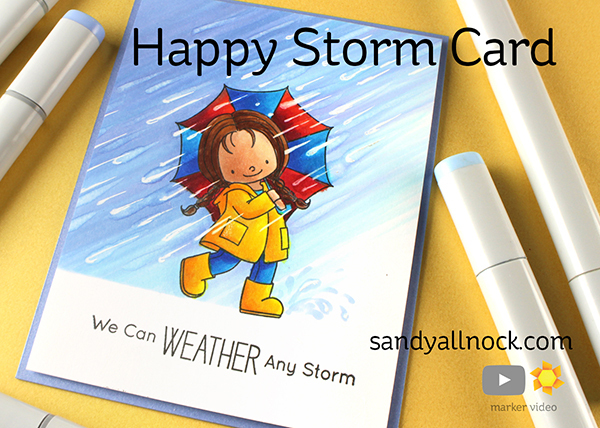 Hi Sandy, really cute cards and fun backgrounds. May I suggest, instead of the 3D Glossy Accents on the raindrops one can use the clear Sakura Glaze-pen? 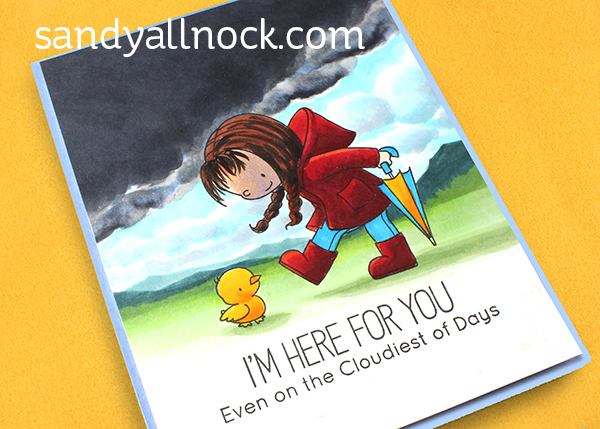 Cute cards with sweet sentiments. We’ve had an all-kinds-of-weather day here in N Calif so I snapped some quick photos for watercolor sky ideas. Your video was very helpful for marker techniques—thanks. Awesome cards Sandy, thank you for the lesson in rainy backgrounds! Super cute. So happy to see a video with a set i just got. Love this card! The video was very helpful. Thanks! AWESOME video – I learn so much from you and I wait everyday for each new video – TFS!! Great cards for encouragement – another stamp set I MUST get! LOL! WOWZERS! This rainy scene is amazing! Thanks for the video! This vid was definitely worth waiting for! Thank you for getting it fixed so fast – I know some of us are up and around before you’ve even had your coffee – but that just shows how much we love you!!! I already had a couple of images stamped, and the little girl colored – can’t wait to fill in with those raindrops! Sorry! Video was accidentally set for pm. It’s live now. Thanks, I saw it and as always it was amazing to watch. A fabulous job! All three of those cards are so cute! I love the rain backgrounds, and those storm clouds are awesome! I’ll catch up with the video later. Thanks for more great ideas! Hope the video gets fixed soon. Monday isn’t the same without your cheerful inspiration! Video was not available either on this site or the YouTube link.